“AXEM RED: We fight for evil! AXEM BLACK: We live for disorder! AXEM GREEN: We like what we do! AXEM PINK: We struggle for chaos! 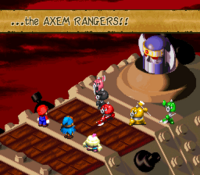 The Axem Rangers are a team of teenage members of the Smithy Gang and appear in Super Mario RPG: Legend of the Seven Stars. There are five members, each with their own distinct traits and abilities. However, all five of them wield a small axe in combat. Additionally, the Axem Rangers have their own battleship, the aptly named Blade. Axem Red is the leader of the group. During the events of Super Mario RPG: Legend of the Seven Stars, Mario and his allies enter Barrel Volcano to locate the sixth Star Piece. Unbeknownst to the heroes, Smithy has ordered the Axem Rangers to recover the Star Piece as well. After Mario and company defeated the Czar Dragon, they discover the sixth Star Piece. However, before the heroes can claim it, Axem Red appears and swipes the Star Piece away from Mario. Then, the Axem Rangers escape to their battleship, Blade. He follows closely behind and jumps onto the deck of the airship. Thus, Mario and his companions engage the five Axem Rangers into battle. Eventually, each ranger is defeated, one-by-one. However, the Axem Rangers combine their strength with Blade's Breaker Beam and begin firing devastating blasts at Mario's party. However, even this is not enough. Ultimately, the Axem Rangers and Blade are defeated by Mario and his comrades. Blade explodes, defeating both the Axem Rangers and Blade, Mario then recovers the sixth Star Piece. Later on, gray Machine Made versions are encountered in the Factory. The Axem Rangers are a parody of the Super Sentai series in Japan, which is the basis for the Power Rangers series in the United States. In battle, Blade is mistakenly referred to as "Axem Rangers" in the English version. The player actually fights the ship, not their combined forces. Not counting Blade, the Axem Rangers are the only main Smithy Gang members (aside from Exor) who do not appear in the ending parade. Each of the Axem Rangers can be seen as an evil counterpart to someone in Mario's team. Axem Pink, the only woman with ability to heal allies and causes status ailment to the opponent, is Princess Toadstool's counterpart. Axem Black, a powerful and fast character with poor magic defense, is Geno's counterpart. Axem Red, the leader with balanced stats, is Mario's counterpart. Axem Yellow, a powerful but slow character, is Bowser's counterpart. Axem Green, with powerful magical attacks, is Mallow's counterpart. ↑ Super Mario RPG: Legend of the Seven Stars Nintendo Player's Guide, page 4. This page was last edited on March 5, 2019, at 13:08.